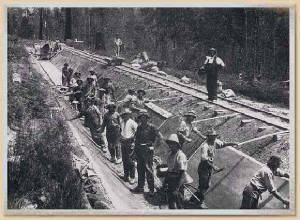 Note: The image was taken in 1913 showing the construction of the Aqueduct. 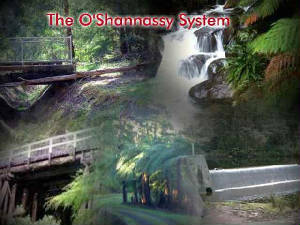 This Research Study describes, in words and pictures, the history of the O'Shannassy Aqueduct Water Supply System, comissioned in 1914, which was Melbourne's major water supply system. It is published to commemorate the occasion of the Centenary of the System. It examines the planning, design, construction, development, and operations of the Aqueduct, the Weir, the Reservoir, and the Silvan Dam, which represented a massive engineering construction project of the time. 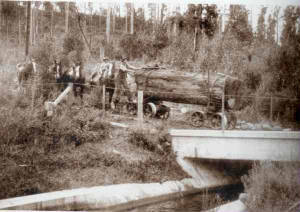 The Aqueduct itself was decommissioned in 1997, and the Study includes information about the transition and evolution of alternative underground forms of water delivery into Melbourne from the O'Shannassy Catchment. Chapters describing the O'Shannassy Aqueduct Trail and the Mt. Evelyn Aqueduct are included. This Study is dedicated to the memoly of the men and women who were involved in the building and operations of the System. This work is compiled by Bob Padula, OAM, of Melbourne, a free on-line dissertation, containing 30 chapters, which brings together many heritage images, maps and drawings. Bob is a member of the Australian Light Railway Research Society, Bushwalking Victoria, and the Great Dividing Trail Association. Each major theme in this Study has its own Chapter, accessed from the Navigation Bar on each Page. The Chapters are arranged in chronological order, where appropriate. All images are thumbnailed. Clicking any image will produce a full-sized display in a new browser window. There is a Search Engine at the top of this page! This will take the reader to a new window displaying the locations in this site for the search query. Many images are out-of-copyright and sourced to publicly available sites on the Internet - accreditation is not required or given. A listing of principal research sources used may be found in the Bibliography. Photographs created by the author are indicated accordingly. The Study is listed under a Creative Commons License. Unless otherwise indicated, all images tagged "2012" or "2013" are those by the author, from his many visits to the region. Targeted adverts are displayed on the site via AdSense. This Project Study is published in January 2013 - it is a once-only Study and will be updated as necessary. This Heritage Study is a work by Bob Padula, OAM, of Mont Albert, Victoria, Australia. He also has a keen interest in hiking, bushwalking, coastal walking, and light railway history, and exploring the mountains around Melbourne, activities which support his involvement in amateur photography. *** His on-line autobiography may be viewed at "Looking Back - 1939 to 2011"
His latest on-line Engineering Research Study is "The History of Short wave Broadcasting in Australia"
Visitors to this site are invited to make a small donation via PayPal to assist with hosting charges. Thank you! Readers are invited to visit any of the folllowing VICTORIAN PICTORIAL HERITAGE WEBSITES, published free on-line, and compiled by the author. Each describes, in words and pictures, the evolution, history, heritage and development of the designated places. Here are some well-known songs, some of which were popular during the years when the Aqueduct System was in operation. Click the title to play once!